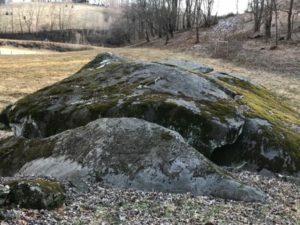 Jack’s Rock, near Cub Creek in Mitchell County, where Jackson Stewart was killed. The old saying “live fast and die hard” could be applied to Jackson Stewart, as well as to his parents and siblings. Almost all of them died in a violent or strange manner, including Jackson. His father, Isaiah, was killed by a falling limb while he was in the woods cutting timber for a fence. His mother, Barbary (Barbara), was killed when she was bitten by a rattlesnake. His sister, Frankie Stewart Silver, was hanged in Morganton for killing her husband, Charlie Silver, with an axe and chopping his body into pieces. She hid the pieces in various places, such as under the house floorboards and in the fireplace. Charlie was known as a drinker and he had abused Frankie. Many locals, aware of her plight, signed petitions to the governor, begging him not to hang her, due to Charlie’s abuse, her young age (18 or 19) and the fact that she had a baby girl. Their pleas fell on deaf ears and she was hanged on July 12, 1833. Jackson’s brother Blackstone, was hanged in Kentucky for stealing horses and his brother, Joseph, died suddenly of unknown causes while on a trip to Washington County, TN. It is unknown what happened to his brother, Charlie, but his brother, John (Johnie), broke the chain of violent deaths in his family and lived out his years with his family on a farm in Bakersville. Jackson was born in Anson County, NC, and grew to a strapping six feet and three inches tall. He, along with his wife Elizabeth and two eldest children, moved up into the mountains of Burke County with the rest of his family between 1820 and 1830. In 1833, Yancey County was carved out of Burke and Buncombe Counties, leaving the Stewarts as residents of Yancey County. In January of 1847, a company of NC troops was organized for the war in Mexico. Jackson’s restless temperament made for a good soldier and he enlisted and left for Mexico along with his oldest son, William Robert. At this point, Jackson was the father of eight children. He and William Robert were in Company D, 1st Regiment of foot soldiers. When he returned home, he and Elizabeth had two more children, making a total of ten. In the mid 1850’s, about 20 years after his sister, Frankie, was hanged for murder, Jackson Stewart became sheriff in Yancey County. In 1854, he was convicted of purchasing land illegally through an agent at his own sheriff’s sale. He resigned from the sheriff’s position in 1858 under a cloud. At that time, he was excused from a judgment for not paying Yancey County’s taxes on the condition that either he or the present sheriff (Solomon Wray) would pay the taxes that were due. (Jackson Stewart would become the first sheriff of Mitchell when the new county was created in 1861.) Later, Jackson enrolled in the Civil War at about age 55. (He put on his enlistment papers that he was 50.) He rose to the position of sergeant, then was promoted to 2nd Lt. in Co. B, 58th NC Volunteers. He resigned in April of 1863, giving old age and failing health as reasons. Two months later, he learned that his twenty-one-year-old son, Jasper, had died fighting at Kolb’s Farm, Georgia. Still eager to aid the Confederate cause, Jackson rode to the Gouge farm in Yancey County in November of 1864 and took their horses for the use of the Confederacy. He had not been gone long when the Gouge boys came home and their mother informed them that their horses were gone, taken by Jackson Stewart. They rode off after Jackson and caught up with him near a large rock at Cub Creek Road. Jackson tried to get to his rifle but they shot him off his horse, killing him. Even after death, Jackson was involved in a lawsuit. In Mitchell County in September of 1866, a woman named Eliza Gibbs brought a bastardy case against him, declaring that he was the father of her child. It was dismissed, as Jackson was deceased. It is uncertain where Jackson is buried but there is a memorial marker for him in Greene Cemetery near Bakersville, NC. Elizabeth is buried at Loafer’s Glory and it is possible that Jackson is buried there in an unmarked grave. This article was provided to the Mitchell County Historical Society by Alice Davenport Charles. She is the great, great, great granddaughter of Jackson Stewart through his daughter Nancy. An addendum from the Mitchell County Historical Society: Although having a commanding presence at six feet, three inches tall, and weighing well over 200 pounds, Jackson was known for helping children and the downtrodden. However, being the sheriff of both Yancey and them Mitchell County, he had obvious enemies in this troubled time during the Civil War and the years that followed. Several versions of the above story exist as well as information about some of the other shenanigans of Mr. Stewart. 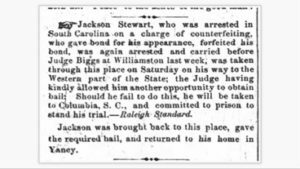 The Asheville News (Asheville, North Carolina) from September 1 of 1859 reports that Jackson was arrested for counterfeiting in South Carolina. The Evening Bulletin (Charlotte, North Carolina) 30 Nov 1864 reported that it was Union sympathizers who rode in from Tennessee and killed Jackson Stewart.